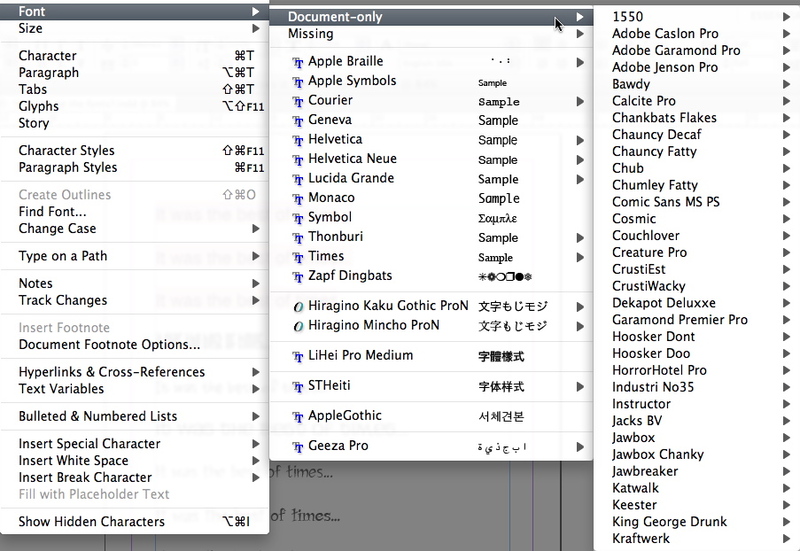 There is a curious new wrinkle introduced with Adobe InDesign CS 5 concerning font management. A new feature debuted with the latest release allows you to locally activate fonts that are located in a folder on the same directory level as an InDesign document in a packaged job folder. Fonts in a Document Fonts folder that is in the same location as an InDesign document are temporarily installed when the document is opened. The Package command can generate a Document Fonts folder when you want to share your document or move it to a different computer. To the average designer, this might not mean much, but this feature could be a godsend to a prepress technician, or those who want to automate InDesign work-flows. Imagine this scenario: A service provider receives a packaged InDesign folder - the document and all the assets, images and fonts are included in this folder - and the service provider opens the document and prints it. There is no need to import the fonts into any system fonts folder, or add them to a third-party font manager and activate them. It takes one of the most annoying steps out of the production process. While this may sound ideal in the this specific situation, Adobe’s implementation has some odd facets. First of all, if you noticed, the folder name from the help file is “Document Fonts.” In previous versions if you packaged an InDesign job, the fonts folder was simply called “Fonts.” What this means is that this feature will only work for projects packaged from InDesign CS5. There is a way around this. All you need to do for older packaged documents to use this feature is simply rename the “Fonts” folder “Document Fonts.” For those looking to use this feature with automation, this renaming process can be easily scripted and take that hitch out of the work-flow. Secondly, this offers an interesting dilemma for enterprise administrators or managers who are very interested in controlling what fonts enter a businesses work-flow. Keeping rogue, or unauthorized fonts, out of a work-flow is always a challenge. But most third-party managers offer some sort of administrative control that can keep end-users from adding rogue fonts. There are also tools available that admins can use to lock down they system font folders so their more savvy end-users cannot circumvent their font management control policies. Now, with Adobe’s document fonts feature, all an end-user needs to do to get around these policies and controls is create a Document Fonts folder in the same directory as their InDesign document and add fonts to that folder. 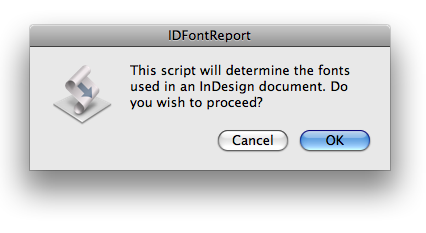 The fonts added there will be active for every InDesign document opened from that directory as well. This represents a real security problem. 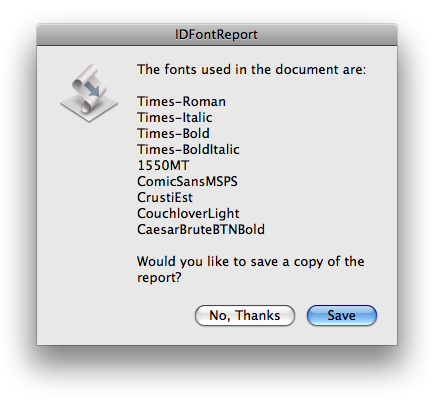 Some Type1 fonts are not available in the document. In my testing, which was not exhaustive is any way, I didn’t get any PostScript fonts to appear in my documents using this method. These fonts would, however, appear if I placed them in a system folder or imported them into a font manager and activated them. The consequence of this interesting caveat would be that this is not a reliable method to activate fonts in a work-flow containing PostScript fonts. PostScript fonts may be going the way of the dinosaur, but they are still in wide use. To use this feature full-time in a work-flow would require the removal of all fonts in PostScript format. This feature in no way limits you from continuing to use your current font management routine. And unless you receive a lot of jobs that have been packaged from InDesign CS 5, you might never notice it. But it is interesting to ponder if this a one-off feature from Adobe, or a signal of more font management capabilities in their software to come. To view Adobe’s video on using document installed fonts, click here.